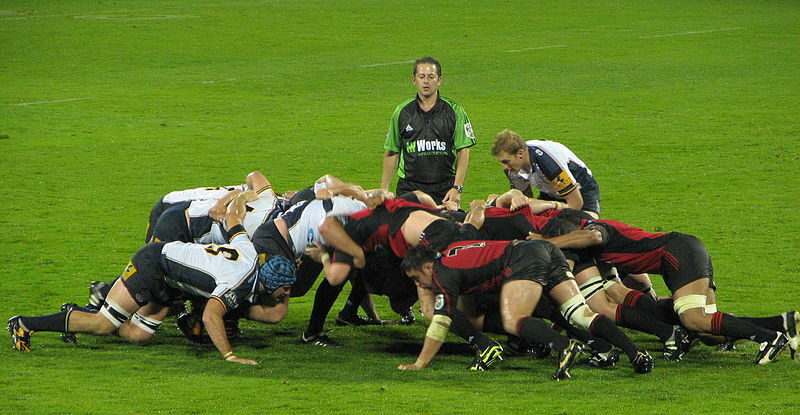 The game of rugby uses an iconic formation called a Scrum, players with arms linked around one another in a tight formation, working in concert to move the ball a few feet forward against an opposing group from the other team. From a spectator’s view, it looks like an unruly knot of violent pushing and shoving with no real goal. In reality, the actions of the scrum are governed by strict rules of conduct and the participants are specially trained players with specific roles. Those requirements not only maintain the competitive fairness of the situation, but protect the players from serious injury. While we see only their hunched forms in a large tangle of bodies, the players are doing what they do best – responding to an ever-moving ball in a tightly controlled situation with a very specific goal in mind. Similarly, the field of software development adopted the use of the word scrum to describe project development teams and their methods. A project scrum focuses a team of highly skilled professionals on a goal-oriented outcome which may continue to change and shift as the project develops. This is a relatively new method of project management. Traditional project management principles center on the development of a long-range plan which includes a detailed, clearly defined finished product, and which attempted to identify every change and pitfall that could occur along the way. That sort of plan usually leads to confusion and frustration, as project goals and external circumstances begin to shift as soon as the project begins. By contrast, a scrum attempts to remain nimble, responding to new goals and requirements as they come in, and focusing on specific short-term goals to move the project along towards the finished project. There are many roles involved in a scrum project, but one of the most challenging and nuanced is the role of the scrum master. In a role that falls into the “more art than science” category, the scrum master takes on the gentle but firm role of servant leadership and communicator-in-chief. A scrum master does not set the requirements of the finished product and they do not lead the team in the details of implementation. Instead, the scrum master is tasked with maintaining the broad vision for the future while removing the impediments that might threaten the work of the development team. When I was more active in professional project management, I used to say that I stood in the gap between those that knew what they wanted and those that could get it done. The best gift I could give to a development team was to say “Tell me what you need to make this happen and I’ll get it and then get out of your way.” On the other end of the project, I could go to the primary stakeholder or client and say “Here’s what you need to know in straightforward, non-technical language. How does that match your vision and what has changed?” It’s a soft skillset, not necessarily rigid with lists and tasks, but nimble and responsive, able to find solutions with more finesse and positive results. That kind of leadership deals with people and relationships over schedules and tools. Does your church have a five year plan? A ten year plan? What good is it? Most plans like that are created to satisfy an underlying fear that “we need to be doing something.” They are developed, filed, and promptly forgotten or overrun by circumstances. Do you know what your ministry setting will look like in one year, much less five or ten? Can you predict the disruptions of a loss in personnel, a change in the community, shifts in political climate, or natural disasters? Instead, ask yourself – who do you want to be? Skip the juvenile and overly simplistic answers and do the really hard work of discovering what God is dreaming about the future of your church. Create a vision of the future that has passion. People want to be a part of something passionate and meaningful. Then, allow your church to organize itself around that vision. Let people bring their own gifts that can move you step by step towards that future. We are not following a map, but a compass. We can rarely see beyond the next few steps of our journey, so it doesn’t make sense to plan further than that. Instead, we have a general direction pointing us like a compass needle. Rely on those leaders among you who can function as scrum masters. Allow them to stand in the gap, continually pointing us towards our future and communicating. Let them remove the challenges that stand between the people that know how to get things done and their immediate goals. Finally, let them continue to keep us nimble, responding to the shifting landscapes in which we worship and serve. Who’s your scrum master? If you need guidance along the journey, call us at The Center for Healthy Churches. We’ve got a host of scrum masters waiting to help you.